When most people think of courtroom presentations, they think of computer-aided graphics like PowerPoint presentations or movies – or of written guides such as charts, graphs, and timelines. They don’t usually think of physical, scale-model creations. In the appropriate cases, however, physical models or scale models can be extremely convincing to jurors, especially those jurors who are “kinesthetic learners” – those who learn best from three-dimensional objects. Every jury is likely to include one or even two of these people, and it is important to present information in ways that are suitable to their learning style. We have built effective models in a variety of case types including patent infringement cases, Hurricane Katrina cases, and aviation cases. As Dallas attorney James L. Mitchell wrote in 2003 [pdf] in a paper presented at a litigation and trial tactics seminar: Scale models which are fabricated specifically for a case . . . can serve an explanatory, illustrative function which is difficult to duplicate with any other medium. It is important to remember that even when the model is present in the courtroom, it is still useful to present it with photographs (and/or slides) or with the use of the courtroom video visualizer. After the jurors look at the model and grasp the overall spatial relationships involved, they may get a clearer view of the specific areas at issue through a photograph rather than the model. 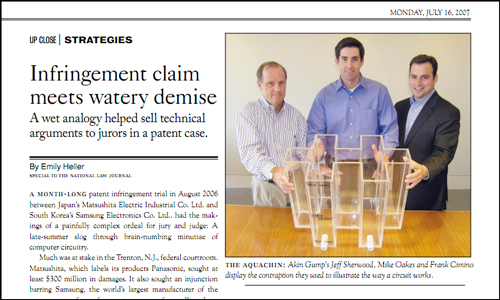 ​In a major patent case, we helped attorneys for Samsung Electronics Co. Ltd., show how electricity flows through computer memory by building a 15-gallon, clear plastic water tank. [View full article at right here pdf] At issue were Samsung patents for reading the electrical charges in computer circuitry. Samsung’s expert contended on the stand that the way the Samsung circuit was built, electricity would discharge completely under the proper circumstances. The opposing expert from In Matsushita Electric Industrial Co. Ltd. disagreed. In a courtroom demonstration, the water in the tank did in fact completely run out, into a tub on the floor. ​In a month-long trial, the jury ended up rejecting a challenge to the patents that had been posed by Matsushita. 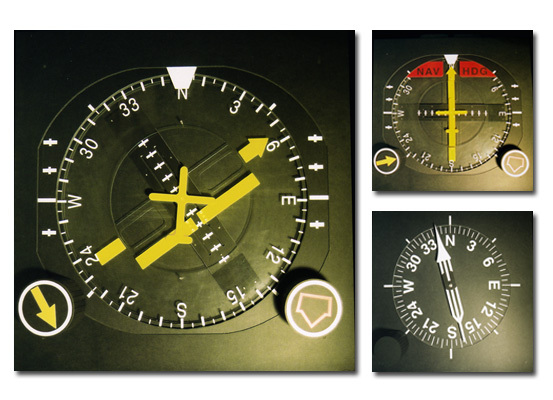 ​In an aviation case, we built models of airplane instruments that were 4 feet by 4 feet in length in order to show how what happened when the knobs on the instruments were turned: The dials moved as well via a gear system that we designed and built. 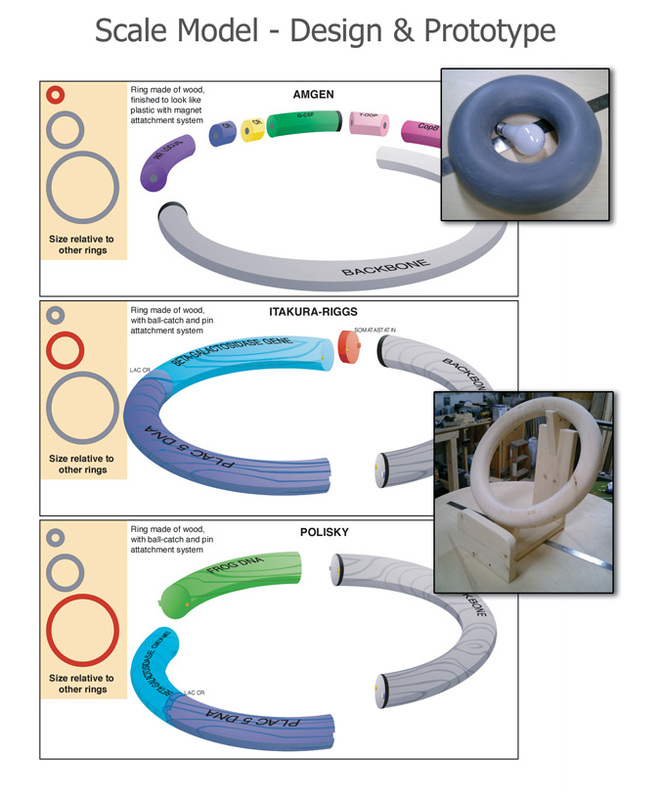 In a patent case involving blood plasmids, we built a set of wooden rings that were intended to show the composition and relative sizes of various competing products on the market. Each of these examples nicely illustrates what is possible when good trial lawyers work with highly creative people to thoughtfully prepare for trial. As we say -- it is a winning model!